Posted byDave Coustan	 February 27, 2008 February 28, 2008 3 Comments on Twitter Session Bug? Update: As of 11:40 EST on 2/27, Twitter reports that the bug has been fixed. It looks like it’s back to normal, though I do think I see at least one person in my following list who wasn’t there before the bug. Maybe that will be a fortuitous meeting :) More details now up on the Twitter Blog. Big ups to Twitter CEO Jack Dorsey for keeping us in the loop. Twitter is acting very strange right now. 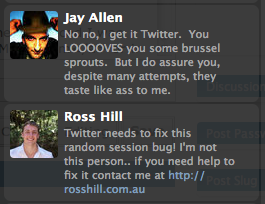 Every time I hit “log out” on Twitter.com, it pops me in to an authenticated session as some other random user. Each time I hit it I come up as a different user. I first noticed this when @misc mentioned it in my twitter feed. Then I noticed I was receiving tweets from people I am not set up to follow. No news on TechMeme.com or in my news feeds about this yet. Nothing on the Twitter blog. At least one conversation started in Get Satisfaction so far. It’s trippy. As @laughingsquid (or someone in his account) put it: “Twitter ate the brown acid tonight”. It reminds me of that big Hotmail panic in ’99 when you could access any Hotmail user’s account you wanted to for several hours one day. And yet, no error message and none of the usual “We’re working on something” pages with the cute birdie or hehful pun on them. More on Digg. Spurious Ink calls it an Epic Fail. The way people are typing random messages in accounts that aren’t theirs — it’s kind of like looting. Thanks, Jack, glad to hear you and the team are on top of it. Good luck and best wishes for a quick and simple resolution. Should be resolved now! We’ll be updating the blog.